Probiotics represent a nutritional live microbial supplement that positively affects the host by enhancing the microbial balance. They work in a number of ways including: competitive exclusion, production of bacteriocins and lowering of gut pH. Although all probiotics’ mechanisms of action are not yet fully understood, it is known that they also have an effect on immune responses in the gut, which reduces inflammation. The use of probiotics has been suggested for the prevention and treatment of gut health problems, including acute infectious diarrhoea, antibiotic-associated diarrhoea and inflammatory bowel disease. 2-4 capsules: one bottle will last 1 to 4 months, depending on dosage. If taking two or more capsules daily, divide daily dose in two. One in the morning followed by one at night. People with severe gut issues should take a therapeutic dose for a period of time as directed by their practitioner. Click here for the Bio-Kult dosage recommendations for GAPS conditions. 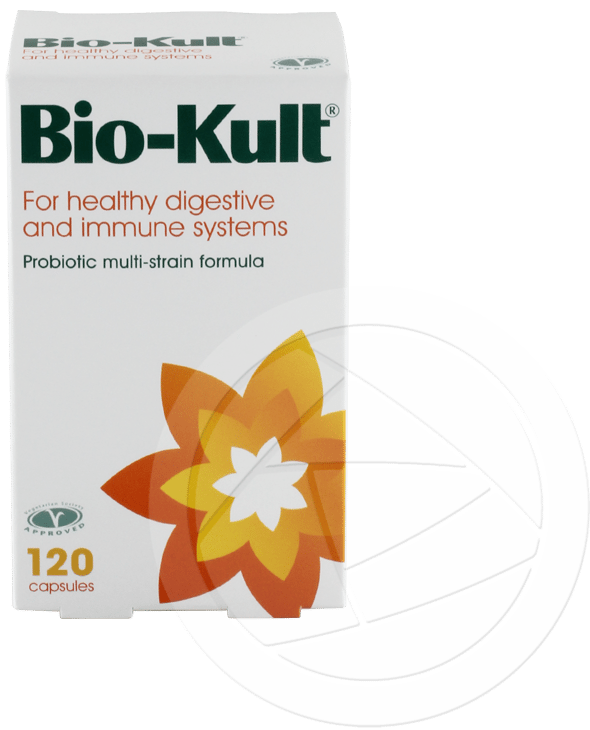 Bio-Kult contains probiotic strains that have been shown to produce lactase, the enzyme needed to break down lactose, which is usually lacking in people intolerant to lactose. Bio-Kult contains traces of milk products at a level which would not affect lactose intolerance sufferers. Manufactuers Comments: All our Bio-Kult products are manufactured to an extremely high standard (cGMP accredited) in our purpose built facility in Somerset, enabling us to stay in complete control of our quality standards. Bio-Kult probiotics are manufactured using the latest techniques. The beneficial bacteria themselves are encapsulated (with a protective coating) during a freeze drying process (lyophilisation). This process protects the bacteria while on the shelf and from the harsh acidic environment of the stomach (shown in vitro to survive pH2 for 2 hours). The Bio-Kult blister pack offers further protection against moisture and extremes of temperature. No refrigeration is required due to this high protection. An external laboratory undertakes rigorous stability testing on our Bio-Kult probiotics so unlike some other companies, we are able to guarantee stability and count until the end of the two year shelf life when kept at room temperature. Whilst the manufacturer advises that Bio-Kult does not require refrigeration, some states in Australia will be exposed to higher temperatures compared to those overseas so if the customers expect to store Bio-Kult for longer periods of time beyond 3 months with temperatures rising above standard room temperature or above 30 degrees, we encourage you store Bio-Kult in cool dry place or in the refrigerator. Bio-Kult is suitable for: Gluten free, Casein free, Lactose free, Yeast free and Salt free diets. Bio-Kult no longer contains maltodextrin. Bio-Kult is a non-GMO product: The bacteria strains used in Bio-Kult are not genetically modified and our supplier confirms that the soya used in the fermentation process of Bio-Kult probiotics is non-GMO. We use a certified non-GMO cellulose as a bulking agent and our capsules are all vegetable based made of certified non-GMO hydroxypropylmethyl cellulose and approved by the Vegetarian Society. No Hidden Ingredients: We can confirm there are no hidden ingredients in Bio-Kult other than those listed on the label. A: There seems to be a trend engaging the market for prebiotics or probiotics with prebiotics contained within them. In light of this, Dr Natasha advises that prebiotics generally feed pathogens as well as beneficial microbes and that is why they are on the avoid list and for this reason she does not recommend using them at the beginning of the programme. Patients who start prebiotics too soon will have symptoms associated with flatulence and bloating.